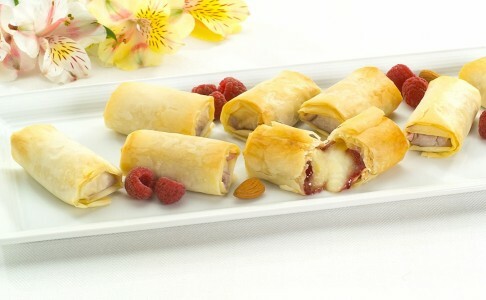 Our Brie & Raspberry with Almonds in Phyllo contains Double cream brie cheese mixed with toasted almond flakes. Topped with raspberry jam and wrapped in phyllo dough. 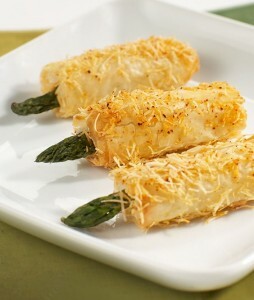 This Baked Brie in Phyllo Appetizers tastes Best if baked from frozen on parchment paper. Hotel quality oven - 350 degrees for 8-14 minutes. Electric oven - 400 degrees for 16-22 minutes. Gas oven - 375 degrees for 16-20 minutes. Rotate baking tray 180 degrees halfway through baking process. Cooking times may vary based on oven. Could not keeped the platters restocked with these quick enough! 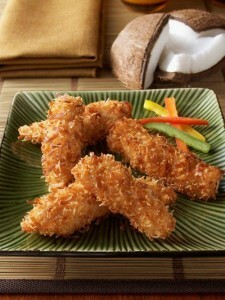 These had the sophisticated flavor and style, yet still were delicious and comforting! My clients and guests LOVED these and didn't hit the dessert items until these were all gone. In fact - I had not one appetizer left from ANY of the items I bought from you. Again, these baked off beautifully, presented well and were devoured by ALL!!!! 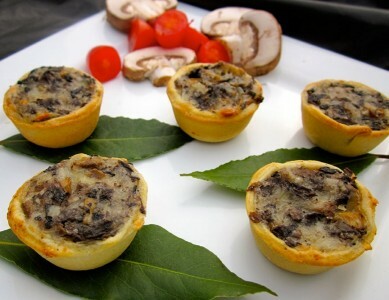 I walked these around the party on a warm pizza stone and my guests loved them... too much, in fact, since there wasn't one left for me!